If you thought peace, love and music had long gone the way of the dinosaur, you were not at HickoryFest II. The second Music in the Mountains this past weekend at Stony Fork Creek Campgrounds was, by all assessments, a huge success -- from the performers and the crowd to the weather and the location. "It was a magical weekend," said singer/songwriter Van Wagner, from Danville. "I can't think of one negative thing to say." "It's been extraordinary," said Bucky Green, a member of the Cherry Flats Ridge Pluckers. "The friendship, the camaraderie, the wonderful volunteers -- it's a family that's getting larger!" HickoryFest/Music in the Mountains is the brainchild of The Hickory Project, the Wellsboro-based bluegrass/newgrass/swing band. Members Sue Cunningham, Anthony Hannigan, Dan Shipe, Dave Cavage, and Steve Belcher wanted a venue for "the many excellent musicians we have met in our travels, as well as to expose area music lovers to these wonderful artists." To that end, they hosted the first Music in the Mountains last year at Stony Fork Creek Campgrounds; building on that success, HickoryFest II was a natural. "I think it turned out well," said Cunningham. "We've gotten a lot of good feedback. It's good for the community too -- the hotels and the campground are full." Campground owners, brothers Carey and Randy Grim, who purchased the business in April, admitted they hadn't known what to expect. "We're new at this," they said. "This is our first year for it." "It took us a day to get a handle on it," commented Carey Grim. By Sunday afternoon, they said that, from their perspective, things had run quite smoothly and they'd be willing to host the event again next year. They had made some improvements and plan to do more to "make it easier on us and better for them." "People love this place," said Hickory Project bassist Steve Belcher. "That's one of the draws. It is the most beautiful valley in the country." Aside from a bit of rain Saturday, the weather was cooperative. That with a mellow crowd and excellent music equals a harmonious mix that can only get better each time it's played. VAN WAGNER, ON GUITAR, JOINED members of The Hickory Project and other bands for the finale of Hickory Fest II Sunday afternoon. Sue Cunningham, Hickory Project fiddler, is shown on the left. The Hickory Project is heading to a music festival in Ireland this week. August 2002 for "Idaho World"
There's a new guy in town. Actually, he moved to Garden Valley last June, so that would be "in the County." Van Wagner looks like a cross between Chris Issac and a young Elvis, with enough stage presence and charisma to steal anyone's attention. He's from the hills of Pennsylvania, coal country, he even worked underground in a coal mine. He has exactly enough "aw...shucks" humility to prove his sincerity, but I'm telling you right now, there's no further proof needed: he's the real deal! What Van Wagner acquires with a successful mix of guitar, harmonica, mandolin & banjo-flailing frequently resonates back to Woody Guthrie, Pete Seger, Bob Dylan and John Prine's acoustic Folk & American Bluegrass music. Oh, and toss in a little of Leadbelly's Blues, too. With eight albums under his belt and one more on the way, he draws on his ingenuity for a tender twist in the context of interesting compositions, strong vocals, and lyrics that add a stage of poetically intriguing innuendoes. His mix of mix of Bluegrass, Folk and "Roots" music might be classified as Rural American music, maybe even Traditional. But one can't classify Van Wagner himself. It's obvious he's on a quest to forge his own sound on bluegrass's tried-and-true foundations. Ben and Maureen Carr, musical "fixtures" in Berks County, Pennsylvania, host one of the area's longest running "Open Mic Nights" at the Blue Marsh Tavern in Bernville, PA. The Carrs have performed at fundraisers, schools, libraries, bookstores, restaurants, and taverns. Maureen Carr, when questioned about Van Wagner and his music, replied: "He writes and performs with a truth and simplicity that, for some reason, seems to elude most artists today." Van's newest album "North of 80" (that stands for I-80, as in "the Interstate") is filled with all-original infectious music that will earn its own spot on your shelf. Van is one heck of a singer-songwriter who will surely fill many venues with his presence and fill the imagination with his songs and stories. He possesses a melodic haughtiness that runs like liquid from his throat spinning tales of all that is important to him: family, history, honor, freedom, and all the 'loose-skinned dogs' of the world. "A young GI stands in a valley of green. in a country he'd never heard of until a year before. Half way around the world in the Viet Nam War. It's the only thing he's found that keeps his head straight. Each cigarette he burns marks a man who's gone down. He's feelin' bout as empty as the shells on the ground. Well, ain't it time we tell him he ain't alone? Welcome home, GI, welcome home." What's remarkable is this: Van is only 25 years old. He sees our world through the eyes of an "old soul", critically transferring his observations to lyric and music. This young soothsayer enchants his listeners by artistically threading his visions throughout his songs. He tells stories as well as Arlo Guthrie, Bob Dylan or John Prine, and has raised the bar considerably in terms of level of musicianship. I?m very impressed! I do feel a little sorry for those whose exposure to music is limited to the mass commercial media. Under those circumstances, it would be easy to become thoroughly discouraged by quality of music coming from the younger generation of video-oriented bands and manufactured teen pop stars. Van Wagner unquestionably detonates that assumption about the younger generation with possibly the most impressive Rural American music in years. Van Wagner has attracted a fair amount of media attention back East, and now that he's a Boise County "local", I'm sure the same will follow. His music is full of solid, brilliant, emotional song writing, so make sure to see him when he performs around Boise County. (c) Copyright 2002 Rusti Schilling. All rights reserved. This review may not be copied or reprinted without written permission. "Van Wagner is a singer-songwriter from Danville, PA. Like Woody Gutherie, Bob Dylan and more recently Greg Brown, Wagner captures the slow death of small town life and the trading of American ideals, namely hard work and honesty for over development and quick riches." Wherever Van Wagner, of Danville, expresses himself in what he typifies as "Rural American Music," people listen and then ask for more. At 25, the Penn State graduate credits a group of area bluegrass musicians for helping him develop his innate gift for making the melodies that come out of his stringed instruments--the banjo, guitar and mandolin. "Over the years, I've been meeting as often as possible with a group of bluegrass music devotees right here in the Susquehanna Valley," notes Wagner. "I have to thank the Bluegrass Jammers for accepting me and letting me participate." In time, Wagner developed his own Rural American Music style. "It's not really country, and it certainly isn't bebop," Wagner insists. "All I know is that the kind of music I create stirs the hearts of a lot of ordinary people just like me." Wagner has set himself a goal of producing at least one album a year. Already he has created four CDs. They make the rounds under his own Appalachia Acoustics label. Titles of Van Wagner's CDs include: "Flat Bottom Town," "Ball Top Mountain," "Climbing to the Top," and "Living in Myself." To date, his musical creations have added up to 150 songs. Ask him how his music is circulated, and who is responsible for making his work known in the crowded musical field, and Wagner will proudly admit that he's the promoter of his own Rural American sounds. He does it by traveling across the United States and Europe. "I go wherever I'm given an opportunity to set up a concert," Wagner continues. "Recently I spent two weeks in Scotland and England. They love my kind of music over there. I intend to return and entertain as often as they'll let me." In appearance and musical flair, Van Wagner rivals the world-famous pop star Ricky Martin. But Wagner insists that should he become a world-famous celebrity, he never will allow himself to be changed. "I don't intend to ever outgrow my small-town roots," says Wagner. With his sights on the skies, and his feet on the ground, Wagner currently works as "...a part-time science teacher who works full time." By way of explanation, he says that the teacher for whom he's been substituting has been ill. Thus the bluegrass musician (who also happens to be a science teacher) is practicing skills he acquired at Penn State. And when he's not in the classroom, Van Wagner works as a coal miner for R&R Anthracite Coal Mining Company, in Good Spring, Pennsylvania. Responding to our raised eyebrows, Wagner says: "That's right. I enjoy working in the mines. It's a great job and keeps me in touch with earthy things." Apparently, things of the earth are part of Wagner's family. He is married to the former Tamara Botto, of Berwick, also a Penn State graduate. She works as a soil conservationist for the U.S. Department of Agriculture. "Van Wagner, a local star in the bluegrass scene, opened the stage and emceed the concert. He performed songs from his new CD, “Going Back to Bald Top Mountain,” such as “Empty as a 3 a.m. Bar” and the title track from his CD. His skills were amazing to watch and his speed on his guitar was intriguing." devised playlist based in tuneful melodies and meaningful lyrics." “..... Wagner’s tall and kind of lanky..... His music has a strong folk and bluegrass influence and he sings about the coal region, people he's met, and his own life. The notes he strums out of his guitar are hard and raspy. His melodies are sometimes gritty like a coal town or trickle like an Appalachian spring....."
- Feb. 25th, 1998, Buzz Magazine, by A. Smeltz. "A great collection of original songs by Van Wagner, a guy who seemingly writes songs at the same rate that Bill Monroe did. Van's great voice and instrumental abilities will have you thanking yourself that you purchased this CD. I consider Van a great songwriter because he writes songs that touch people's emotions. Everybody knows a guy like "Smokeless Joe," everybody has a special "Flat Bottom Town" that they call home, and if you need a good laugh then listen to "Must Have Been My Guitar." Overall, a great collection by a great singer-songwriter. I proudly play it on my radio show. " At 24, singer/songwriter Van Wagner has experienced more than most do in a lifetime. He once worked in the coal mines, on farms, as a logger, and as a substitute high school science teacher. Growing up in a family he describes as "well-off," he refused to be served on a silver platter. "In high school, I started looking at things in life outside of money or impressing people with material things," Wagner recalls. "I'm happy making just enough money to buy my next set of strings." He started playing the guitar at 8 or 9 in his hometown of Danville, continued with a few local shows throughout college, and as of five years ago, boosted his solo act into a full-time career. Wagner, on his choice of instrument (guitar, banjo, or mandolin), has constructed close to 200 original songs and produced nine albums. The material for his creations comes from "whatever inspires me at that moment," Wagner explains. "It could be a person, place, thought, anything." A few songs have even appeared on the soundtrack of History Channel documentaries. 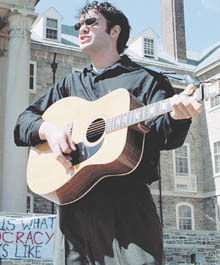 His latest solo album, Going Back to Bald Top, features 16 tracks dedicated to his ongoing theme of Pennsylvania, which is also evident in his live shows. "Anyone from Pennsylvania enjoys the theme," Wagner says, "hearing local names. It's a neat glimpse at rural Pennsylvania - too much music today comes from a city-based influence." Expect a few hand-picked songs from his greatest influence, folk legend Woody Guthrie, to sneak into the set. Wagner is satisfied settling in his nest in Schuylkill County, Pennsylvania. He's toured worldwide, but he prefers playing within the state. And he claims if Columbia Records approached him with an offer, he'd turn them down. "As long as I can support myself," Wagner says. "It's a cool freedom. There's no hidden agenda for me to make it on the charts - that's not what I'm in music for. I want to keep it as personal and real as possible." Review of Album "Flat Bottom Town"
Van Wagner is a singer-songwriter with a special gift for capturing a place. That place is his hometown of Danville, PA, a backwater (flat bottom) town on the banks of the Susquehanna. While the subject matter may seem personal or arcane, Wagner uses the setting to convey universal themes that relate more to the history and sociology of our country than to the history of one town. Like Woody Gutherie, Bob Dylan and more recently Greg Brown, Wagner captures the slow death of small town life and the trading of American ideals, namely hard work and honesty for over development and quick riches. From the farmer in "Smokeless Joe" to the jaded collge student in "Walk of Shame," Wagner personifies the trend for all listeners while remaining true to the town that inspired him and taught him to sing. Folk singer Van Wagner grew up in the small town of Danville, Pa., on a hardscrabble hill called Bald Top. A tar and chip road off route 11, just outside of town, leads to Wagner's childhood home. The road catapults vehicles up the side of the mountain, past a thick forest of second-growth deciduous trees that rose up from the mountain's soil after it had been hollowed out by iron mines during the late nineteenth and early twentieth centuries. Travelling farther up the mountain, through more thickets of trees, past the upper-middleclass homes tucked in the corners, and turning back to look down on the Susquehanna river slowly winding its way through the Pennsylvania farmland, you realize what an idyllic life it must have been for Wagner growing up here on Bald Top. You understand why, even after all his childhood playmates have long since left the area, Van Wagner, now 25 years old, still calls Danville his home and sings about it, almost obsessively on his albums. You understand why, in a song named after this place, he cheerfully calls for his childhood friends, and by extension, his lost youth, to "come on back to Bald Top mountain." Wagner says he "can't remember a date or time when (he) decided to become a musician." Instead, he adopts the attitude of most independent artists who put a couple dollars in their pocket playing clubs and selling CDs outside their shows. He says he began playing his brand of folk and Blue Grass music to "get into this obscure music that doesn’t make it on to MTV and bring this music to people who otherwise wouldn't hear it." So almost every weekend for the past three years, Wagner packs up his guitar, banjo, mandolin and harmonica and heads out to another Pennsylvania bar, to sing about small towns, mountains and miners. Van Wagner has worked in the coal mine now for just over a year. He works as head laborer; hauling coal through mine shafts over 200 feet below the surface. He is paid three dollars for every ton of coal he moves from below ground to daylight, he gets no benefits and there is no workman's compensation if he is hurt in the mine. Being laid up by a mining injury, he says, "is not a matter of if, but when." He has worked in the mine long enough to earn the respect of the men around him, and to shed the stigma of an educated, middleclass fool, who, for some reason, wanted to become a coal miner. "I've always been interested in Pennsylvania history," Wagner explains. "In pursuing that interest, I would pick parts of the history, especially if it had something to do with Danville--iron, coal, or the mountains. Iron and coal have really been twin interests for me. I wrote songs about coal mining; I've read a dozen or so book about it, seen some movies on it. But it got to the point where I still wasn't satisfied. I loved hearing these stories about the life, but my thirst still wasn't quenched." In fact, Wagner doubted his thirst for mining would ever be fully satisfied. Mining in Pennsylvania, particularly coal mining, is a rapidly dying business and it remains an industry closed to outsiders. "In the coal region," he explains, "they don't hire you unless they know you." But Wagner found a way into the mining society when a student he was teaching at an area high school mentioned that her father owned a coalmine. Wagner talked to the girl's father and secured an interview with the mine's foreman. "My interview, if you can call it that--I walked into this dirty, smoke-filled shanty, and this old man--I could barely understand him--he had this crazy coal cracker accent, tells me I can work there if I go and get 40 hours of below-ground experience. I think the guy thought I'd never come back. But I got the training and started a week later." At first, Wagner was not welcomed into the mining community, and his boss "did not put a lot of effort into [him]." In fact, outside miners, working at other sites, would show up to see the "teacher" who worked the mines. But eventually, as more experienced miners left the job with ailments and injuries and Wagner stayed on, he earned the respect of the crew and became a regular on the gangway. Van Wagner's creative process is typical of most artists. It is mysterious and he is unable to pinpoint exactly where a song comes from, or what causes it to work its way into his head. "The least common way I write a song is to have a musical idea in my head that paints a mood. Like, if I come up with something in a minor key, it paints a darker image--not necessarily depressing. "More commonly, I'll get a story in my head without any music, or some lines will stick in my brain. Like the other day, I was driving through Pennsylvania tobacco country, and I caught this smell, that was unlike anything--not at all like a cigarette or cigar--but just fresh tobacco. So, I got this line, something like, 'the smell of tobacco leaves in the autumn fog.' Something like that. But that may be one line in a song." To date, Wagner has completed four albums of solid Blue Grass, and alternative folk music. The themes that run through his music center on small town life, the plight of the working class, particularly miners and farmers, protest songs against rampant consumerism and an occasional love song--common themes for a folk singer. "I try to make my albums somewhat general and then slip my message in there, without making it too obvious," he says of the political messages in his songs. "If I label myself as a pro-environment singer or a labor-movement singer, many people will write me off and ignore my songs, so I have to be more subtle. I love satire--to make the political songs more of a humorous poke at reality." On the average day, the team of four miners Wagner works with will move 20 tons of coal from the mine to the outside, meaning each worker will earn about $60 for a day's work. They arrive at 7:00 AM to a dusty shanty with a coal burning stove that the miners gather around to smoke unfiltered cigarettes, drink coffee and discuss the day's work. The crew then retires to the changing room to put on their coveralls and pray that the clothes have dried since yesterday's work. "There's a lot of water in the mines, a lot of moisture," Wagner says. "The walls, the floor, pretty much everything is damp, so your coveralls get soaked if you just lay down in there. There's nothing worse than putting on wet coveralls first thing in the morning." After the men have changed, they load up the slope-buggy, or gunboat, with all the supplies they will need for the day. Typically, this includes shovels and picks, mine timbers for holding the shaft in place, an 80-pound drill and approximately 50 pounds, or 120 sticks, of dynamite. Two men are also loaded into the slope buggy, and men and supplies are lowered down into the mine at a 40-degree angle. Once the crew reaches the gangway that makes up the main shaft of the mine, they move the supplies, by crawling on their hands and knees, to the gangway buggy and push it to the coalface they will be mining that day. Upon reaching the coal face, the head miner uses a pick to shear off pieces of coal that were loosened from blasting the day before, but didn't fall into the gangway. "This can be a pretty dangerous thing," Wagner says. "There can be literally tons of coal that falls because it hasn’t been fully blasted yet and you have to know what you're doing. There's definitely a science to it." After the excess coal is cleared away, the head miner drills 15 holes into the coalface. The holes are about eight feet long and one inch in diameter. The dynamite is loaded into the holes and the crew gets ready for the blasting. "After packing the dynamite, we crawl back into the gangway to get ready for the blast. The head miner yells out 'Fire!' and hits the detonator, which sounds just like a camera flash warming up--that high pitched squeal. The blast shakes everything in the mine and 20 tons of coal come down into the gangway, ideally through a wooden shoot that is supposed to act like a grain elevator. "After the dynamite, the fear of a cave-in pretty much disappears, because if something were going to fall it would have fallen then. The mine shakes like a Mac Truck hit the wall. It'll knock you down if you don't hold on to something. Then there's this smell, this really sweet smell that dynamite has. It's a smell I will never be able to forget." As Van Wagner looks out from the mountaintop and down into the Susquehanna River valley, he knows that he is staying true to his own vision of music. His songs come from somewhere between the small town he grew up in and the mine he works today. While he may not have hit the big time, he continues to hold out hope that the current wave of singer-songwriters like David Gray and Blue Grass fusion artists like Bela Fleck will somehow carry him along with it. But for now, he can sit back, strum a guitar or pick his banjo and know that, at the very least, his music is authentic. not altogether smooth and polished. Yet somehow whenever Van Wagner picks up his guitar, he plays with the ease and artistry of someone who’s taken a lifetime of lessons. Wagner’s sound is not refined and tempered; rather, it is gritty, raw. When you pick up his latest CD, “Flat Bottom Town,” released just last month, you might notice there are no effects used, that it sounds as though Wagner’s sitting right there with you in your living room, throwing you your own personal party. That’s exactly what he wants the listener to get from his CD — he and Woody Wolfe engineered it to sound as though you’re hearing it live. He described this musical style as “a snapshot of the music,” what that particular song sounded like at that exact moment he played it. “I never do it the same twice,” he said. It’s not a far stretch for Wagner to be dubbed musical foot soldier, either. 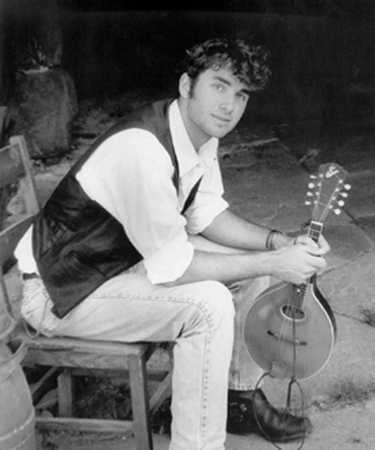 His music is zany and uplifting, a mixture of bluegrass and folk with a rural flavor. He said his music is always progressing and pushing the envelope. The songs on his new release include the ballad “Rise and Fall,” which he performs with his mother, Nancie. Wagner cites his mother as the first major musical influence in his life, which adds a certain sentimental value to the smooth-flowing tune. The rise and fall refers to the steps of a waltz, fitting for a song dedicated to Nancie who has taught many to perform the dance, Van included. A more up-tempo tune, one that is more representative of what the new CD has to offer, is entitled “Must’ve Been My Guitar.” This energetic song tells the story of a hometown boy trying to fit in at a large college campus. Anyone from the area will see this song as an anthem of sorts. The autobiographical elements of Wagner’s life, as well as the appreciation he has for the town in which he grew up, are evident in all his music. For Wagner, music is not a business, it is a creative venue. Van Wagner truly fits into the category of both. DANVILLE — While Van Wagner can’t take credit for all the work behind Danville’s Iron Heritage Festival, he can be seen as the one who got the ball rolling. Wagner’s interest in Danville history began several years ago when he was attending college at Penn State. “I was away from Danville for the first time and I started missing it,” Wagner said. It was that homesickness that inspired Wagner to begin reading about Danville. What he learned was there was a lot more he needed to know. “I decided something had to be done with this story,” he said. Wagner began contacting members of the Danville Area Chamber of Commerce and realized he wasn’t the only one interested in telling the story of Danville. “It started out with me and a few members of the Chamber of Commerce chatting,” Wagner said. From that came the idea of the Iron Heritage Festival, but even though he could feel the excitement, Wagner wasn’t sure how it would go over with everyone else. “I was worried that the average citizen wouldn’t come to a festival that was just history,” Wagner said. A year ago those fears were laid to rest as the first Iron Heritage Festival drew more than 2,000 people who just wanted to know about history. to bring a little color to his lesson, Professor Rich Pawling, who teaches cultural geography at Penn State-Berks, was approached by one of his students. “He asked if he could be in my group,” Pawling said. There was only one problem with future History Alive! Boy Van Wagner’s question. His musically inclined professor was a solo act. Not long after that, however, Pawling got thinking. Soon he decided to extend his History Alive! program to include a band. Wagner was his first call. “I was so impressed by Van’s knowledge of local history, his pride in Danville and his enthusiasm that I decided to go with it anyway,” Pawling said of his decision to start the band in 1997. Wagner cited his mother Nancie as the first big musical influence in his life. His dad Ollie Wagner IV got him interested in folk music and his older brother, Ollie Wagner V, introduced him to the guitar when Van was only eight years old. Similarly, Rich Pawling came from an artistic background. Pawling and his brother did some shows with their father, playing the cornet. “That’s when I learned harmonies,” Pawling noted. The band’s third member, guitarist Joe Meck, is their most recent addition. Meck is a mechanic who lives in Berks County, but, as Wagner put it, he moonlights as “a wonderful guitar player with a very wonderful voice.” Wagner added that Meck is a “very good songwriter” as well.